Kanadukathan is a small town located in the district of Sivaganga and is very close to the town of Karaikudi. The specialty of the place lies in the structure of its houses and the local food. The houses in Kanadukathan are huge and built in the typical Chettinad style. The main doors and entrances of the houses resemble the gateways of the Hindu temples; majestic and intricately carved. The local cuisine of Kanadukathan is prepared in the typical Chettinad style with plenty of herbs and spices. Plenty of tourists throng to the town from Karaikudi to simply feast on the local delicacies. A very common feature that is seen on the streets of Kanadukathan—potholes are covered with a wire mesh. These potholes have been built for rainwater harvesting. The town uses special water purifying techniques to make rainwater usable. All the towns and cities in the country could learn a thing or two from the people of Kanadukathan about water harvesting. 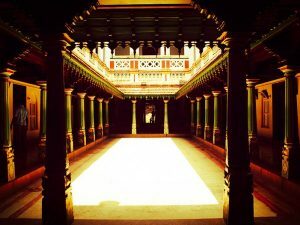 The chettinad houses in Karaikudi, Pallathur, Athangudi and Kothamangalam are the most lavish and expuisite examples of architectural beauty. 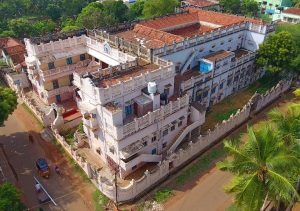 Located at 10 kms away from Karaikudi, Chettinad Place is a beautiful edifice situated in the Chettinad region, in Sivaganga district. It is one of the most glorious examples of chettinad’s widely famed palatial mansions. 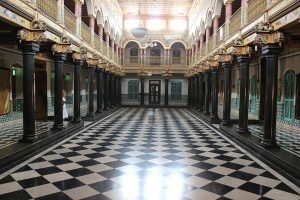 The Chettinad Palace was designed and constructed by Dr.Annamalai Chettiyar, founder of Indian Bank and the Annamalai University in Chidambaram. An outstanding example of the Chettinad architecture, the Chettinad Palace of Sivaganga dates back to the year 1912. It took about two years to complete this palace. It reflects the traditional style of architecture, which is characteristic of the region. Most of the construction materials, decorative items and furnishings used to construct Chettinad Palace were imported from East Asian countries and Europe. All the mansions have lovely teak, marble or granite pillars supporting a spacious verandah. The hall leads to the central courtyard, used for weddings and religious ceremonies erstwhile. At the corner of the courtyard is a room for worship where Rani Seethai Achi, wife of Dr.Annamalai Chettiyar, spent most of her time. Many antiques used by the Raja are preserved in the palace now also. The palace stands tall covering about 1900 sq.ft including 9 car sheds and a lift. Phone: 0423-2533333. 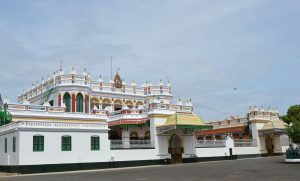 Karaikudi is well connected by road to different parts of the state. Nearest Railway Station: Karaikudi. Athangudi village is located in Sivaganga district of Tamil Nadu and is 24 km from Karaikudi. The village itself comes within the Chettinad area and is very famous all over the country for the hand-made terracotta tiles that are made only here. The tiles are built using cement, sand, synthetic oxides and belly jelly. The terracotta tiles are first shaped and then sun-dried after which they are adorned with artistically made patterns. It is the pattern that gives the tiles their unique texture. The pattern can be decorated with various colours to make the tiles look attractive. People also get customised tiles made for their houses and lawns. The most popular design on tiles for lawns is the one depicting flora and fauna. You can also get the tiles in the colours matching your walls and upholstery. People in the village of Athangudi tend to use these tiles for increasing the appeal of their houses. In fact, the tiles are a common feature in many ancestral houses. Aayiram Jannal Veedu is a famous landmark in the town of Karaikudi. The literal translation of the name of the place means the house with a thousand windows; a very apt name for a house that has thousand windows! The house is very famous among the tourists who make it a point to visit the place when in Karaikudi. In fact, once in the town, simply ask anyone for directions to the house. Built in 1941 on 20,000 square feet of area, the house is very spacious and costed 1 lakh 25 thousand at the time, a meager sum of money now. The house has 25 huge rooms and five very large halls. There are some 20 doors in the house along with 1000 windows. The first thing that strikes when one enters the house is that although it is in shambles and poorly maintained, the original style of architecture and grandeur still remains intact. Kaviarasu Kannadasan Manimandapam is a small structure that has been built in the memory of famous Tamil poet Kavi Arasar Kannadasan who was born in Sirukoodalpatti, a sleepy village near Karaikudi. He was a man who is believed to have changed the face of Tamil literature with his revolutionary writings. He also had great oratorical skills and would mesmerise his audience when he took the stage. He contributed not only to Tamil literature but also to the Tamil film industry by writing songs that became very popular. Many of his writings also found their way into Tamil magazines since he also wrote political satires. His writings have taken on an iconic stature in the state of Tamil Nadu because he gave the Tamilians the voice they were lacking. In his work, he spoke about the problems of the common people; their fears as well as their joys. The Nagarathars built a mandapam for him to honour the man who made their community known all over the country. Vettangudi Bird Sanctuary is near Thirupathur and Madurai. 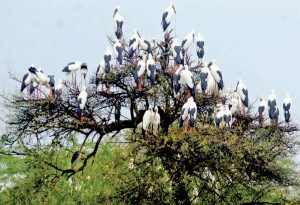 The Vettangudi Bird Sanctuary is located at a distance of 51 kms from Madurai on Madurai – Melur-Tiruppathur road, in Savaganga District. It is located in Vettangudipatti and Periya Kollukudipatti village of Tiruppathur Taluk, Sivagnaga District. This sanctuary covers an area of 40 hectares and covers the tanks of Vettangudi, Periyakollukudi and Chinna Kollukkudi villages. The Vettangudi Bird sanctuary is the natural habitat of winter migratory birds. It is a breeding habitat for Grey Herons, Darters, Spoonbills, Wite Ibis, Asian Open Bill Stork and Night Herons. It has also attracted Painted stork, Little Cormorant, Little Egret, Intermediate Egret, Cattle Egret, Common Teal, Spot Bill Ducks and Pintail. This is a safe place for roosting, breeding and feeding. There is a considerable diversity in their nesting and feeding behavior. The best time to visit would be between November and Fbruary when the weather is pleasant and you get to see thousands of migratory birds. Phone Number: 04567 – 230079.